Before going to sleep in a 24/7 world, we watch TV, surf the web to catch the latest news, check Facebook to connect with our friends, or glance at our smart phones for the latest emails. Although it seems the normal thing to do, evening and night time light disrupts our biological rhythms and can affect our health and even increase risk for cancer. Exposure to light in the evening or night is very recent in evolutionary terms. For hundreds of thousands of years the night was dark as we hid away in caves to avoid predators. Only in the last few thousand years did candles or oil lamps with their yellow orange light illuminate the dark. The fear of the dark is primordial– in the dark we were the prey. During those prehistoric times, our fear was reduced by huddling together for warmth and safety as we slept. Although our present life is far removed from our evolutionary past, our evolutionary past is embedded within us and controls much of our biology and psychology. These days, while sleeping we turn on a night light to feel safe or allow us to see in case we have to get up. For many of us, darkness still feels unsafe since as babies the fear was amplified as we slept alone in a crib without feeling the tactile signals of safety provided by direct human contact. Presently, light permeates our night: the flashing status light of the standby mode of the TV, the blinking lights of our cell phone charger, the soft glow of the alarm clock, and the street lights or flashing headlights of the cars leaking around the edges of the blinds and curtains. These lights and especially the blue light produced by LED, TV and computer screens switches off the production of melatonin as shown in the figure 1. Figure 1. The white line represents the wavelengths of light that suppress the secretion of the sleep-promoting hormone melatonin. The light spectrum of LED, TV and Computer screens has a strong peak in the blue and thus inhibits melatonin production and affecting our circadian rhythm. From: Dijk, D & Winsky-Sommerer R. (2012). Sleep, New Scientist Instant Expert 20. New Scientist, 213(2850), i-vii. Melatonin, the hormone that makes us sleepy, contributes to regulating our circadian rhythms. 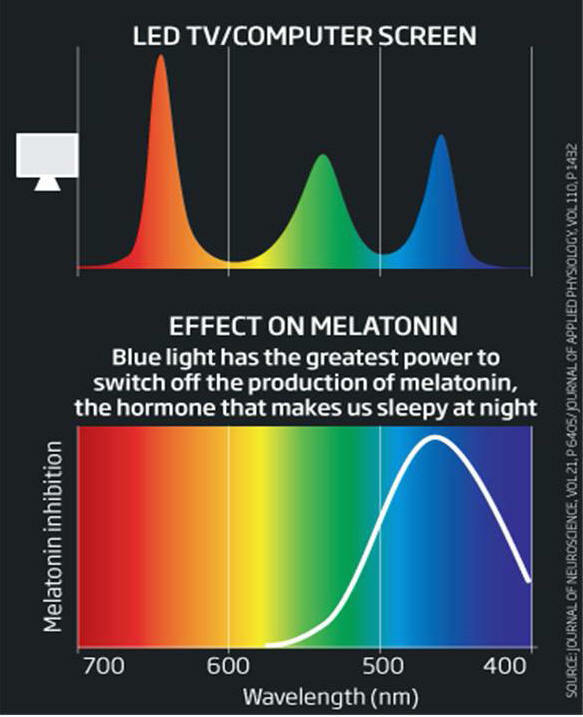 When exposed to the blue component of the light before going to sleep, melatonin production is suppressed, our sleep onset is delayed, and sleep is more disturbed. 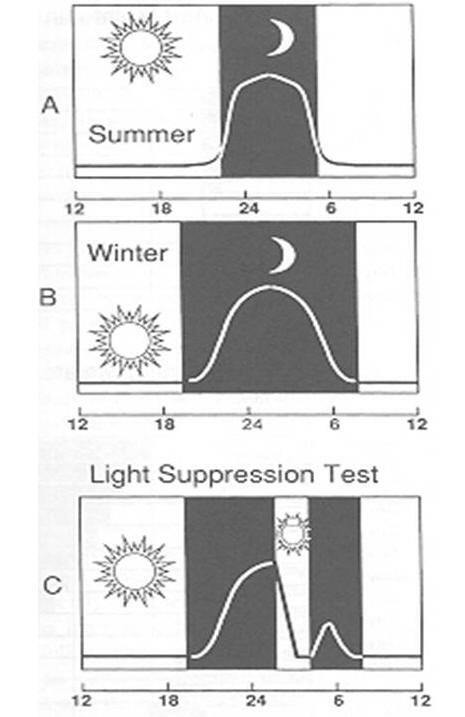 Equally harmful is light exposure during the night because it suppresses the body’s melatonin production which affects and disturbs our circadian rhythm as shown in Figure 2. Figure 2. Exposure of light during the night, decreases melatonin production. From: Sack, R. L., Blood, M. L., Hughes, R. J., Lewy, A. J. (1998). Circadian-Rhythm Sleep Disorders in Persons Who Are Totally Blind. Journal of Visual Impairment & Blindness, 92, (3). The more our biological rhythms are disturbed the greater the risk of illness. For example, shift workers and airline cabin attendants have significant increased risk of accidents and illnesses such as cancer. Studies have shown that lab rats’ cancer cells proliferate significantly more when lights are kept on during the night than in the control group who remain in the dark. The disturbance of biological rhythms is usually associated with increased illness and reduced longevity. This disruption acts as an allostatic load (or a stressor on the system). Do not watch LED, TV or computer screens an hour before going to sleep to enhance melatonin production. Light proof the bedroom and eliminate all light sources –yes, even the small indicator lights on electronic equipment — to maintain melatonin production and maximize your biological rhythm. Install a free computer program such as f.lux™ that makes your computer screen look like the room you’re in, all the time. When the sun sets, it makes your computer look like your indoor lights with warmer colors by reducing the blue light. In the morning, it makes the screen brighter like the color of sunshine. For additional evolutionary perspective concepts and strategies to promote health, see the book Fighting Cancer: A Nontoxic Approach to Treatment. What about star light and light from the moon. Seems like that would have been in our evolutionary history as well as fire for a short time. We can really be sure if hiding in a cave was the norm. What about in a tree? IT’s not just the frequency, it’s the intensity. Star light is way below the intensity threshhold to trigger melatonin supression. You might notice, of course, that on a bright moonlit night with ineffcitive curtains it is indeed very difficult to get to sleep. This is well founded research and available to people who have had behavioral health training to improve their sleep habits. Appreciate the article and the diagram. Will add it to the documents I provide my clients. Fascinating. I’m wondering if LED bulbs have the same affect. I just changed my bedside lamp an LED bulb for energy conservation. But since I usually read before I got to sleep I now wonder if I am doing myself harm? Should I switch back to an incandescent bulb? Yes, LEDs have usually three peaks with one of them in blue. As you saw on the graphic, red and orange light have the least effect. I was looking at some of your blog posts on this website and I think this site is real instructive! Retain putting up. Thhis iss a good tip particularly to those fresh to the blogosphere. Short but very precise info… Appreciate yor sharing this one. The light from a full moon is at least as bright as the night light I have. Has there been a study of melatonin at different phases of the moon, maybe in people who are not exposed to other lights? f.lux doesn’t remove the blue — which comes from the backlight. Your computer/phone may be different but anything that uses a white LED or white fluorescent backlight will still emit some blue. f.lux changes the color of the pixels through which the backlight shines. That will work, but if you want to be able to function while your brain’s cranking up the melatonin, until you’re too sleepy — just eliminate all the light from 400-550nm, the “low blue light” approach. You can look that up too. We’ve been using “turtle safe” LED amber lights in the evening for years now. Yeah, turtle safe — baby turtles hatching out on the Atlantic coast at night head toward the brightest light, which in natural conditions is the full moon rising over the ocean. Yeah, moonlight is high in the blue — it’s exactly the same color as the sky in daytime, as you can see in night time exposures. So to keep the baby turtles from heading for the freeway and the wall’o’condos, the Florida Wildlife and other groups require lights that don’t emit in that 400-550nm range. We switch the lights around 8pm, and are nodding off by 10 to 11pm. There’s at least one highly filtered LED out that looks white we’ve found also works for us; so do “bug light” yellow lights, and so do yellow full-coverage theatrical gel films over lights like the computer and phone screens (Rosco makes them and the Rosco site shows exactly the spectrum that comes through each. Orange and amber and yellow of varying kinds work. Just an amateur reader here, who noticed this stuff early and I’ve been following it since.